Choosing between the 2017 Hyundai Sonata and the Toyota Camry can be a little daunting, since both are known for their thrifty fuel economy and attractive price tags. We're here to help. Check out our comparison guide to learn more. That way, you can select the mid-size sedan that truly speaks your language. The Sonata's roomy cabin and supportive seating are exactly what you need to get through rush-hour traffic in a relaxed state. If you want a little extra style, check out the Sonata Limited's two-tone color schemes and handsome wood trim. The trunk's generous 16.3 cubic feet of cargo space are the perfect place for your weekend bags and sports gear. The Camry's rear seats are especially spacious, and even tall passengers will fit comfortably back there for hours on end. However, the Camry only provides 15.4 cubic feet of cargo space, and it's not quite as stylish as the Sonata, which sports impressive build quality and attractive materials. To save the most money at the pump, choose the Sonata. 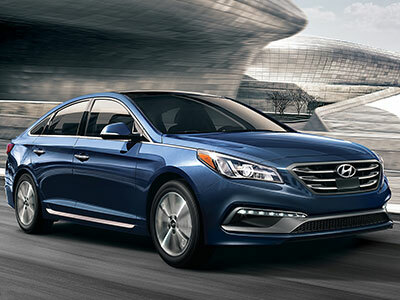 Depending on which powertrain you select, the Sonata earns up to 28 city/36 highway mpg. With that kind of thriftiness, all that's left to do is decide whether to spend or save that extra cash. 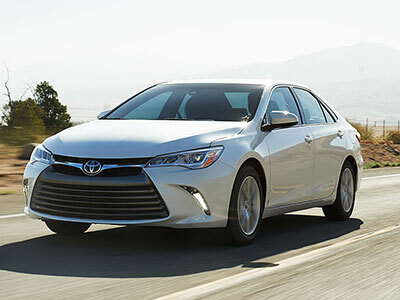 By way of comparison, the Toyota Camry earns up to 24/33 mpg. That's not too shabby, but the Sonata's ratings will add up to greater savings in the long run. In the safety division, the Camry comes out on top. In government crash tests, it earned a perfect five-star rating for overall protection. The Safety Connect telematics will put even the biggest worrywarts at ease, because it provides safety-net features like an emergency assist button and automatic collision notification. Like the Camry, the 2017 Hyundai Sonata offers high-tech safety features designed to alert you to potential danger. The blind-spot monitoring system, for instance, alerts you to vehicles that have creep into your blind spot, and it warns you to wait before switching lanes. Once again, we like what the Sonata has to offer. Its central infotainment system is highly functional, with dedicated buttons for important features like navigation, phone, radio, and media options. That way, you don't have to sort through endless touchscreen menus to get to the feature you want. The system also provides Apple CarPlay and Android Auto capabilities, so you can access smartphone features from the Sonata's central touchscreen. The Toyota's Entune infotainment system does a good job at keeping you connected - with capabilities like hands-free calling and turn-by-turn navigation. However, it doesn't offer Apple CarPlay or Android Auto, and therefore can't compete with the Sonata's smartphone integration. Although the Toyota Camry has a certain appeal, the 2017 Hyundai Sonata is pretty close to perfection. In spite of its attractive price tag, the Sonata supplies all the latest tech features, including an attractive touchscreen and turn-by-turn navigation functions with a comfy and spacious cabin that's sure to appeal to passengers of all sizes.